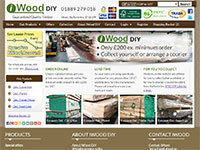 iWood is proud to supply British Douglas Fir. These British Douglas Fir beams are sourced from various locations throughout the UK and are graded to C18 (a fresh sawn grade). These beams are available in thicknesses and widths between 25 and 300mm and lengths up to 7.9 metres. If you have any queries on our British Douglas Fir please call 01889 279 018.